As a rule, agility training should start while the pet is still a puppy. However, owners could still facilitate training with older dogs. The question "when is the dog considered old for agility training" is central to choosing when to start training the dog. Being "old" greatly varies from dog to dog, from the extent of a dog's experience to the innate and natural tendencies it has. In short, there is no specific age at which the dog should be restrained from training. However it is always far easier to start training with much younger dogs since their learned behaviors are still not rooted into their habits. For choosing old dogs for training, the handler should not create the impression that the dog would no longer learn so there's no need to waste time. The attitude of the dog as much as that of the trainer is both highly essential to faster learning. The more dedicated and patient the owner is the faster the dog learns. The introduction to agility training should start with physical exercises. If the handler has enough interest to dedicate on training the dog, the age will no longer matter for it is the condition that will rule over. Simple exercises like jumping or hopping may agitate the dog and encourage him to move a little bit. For puppies, these exercises are much easier to do since they have enough energy to use. 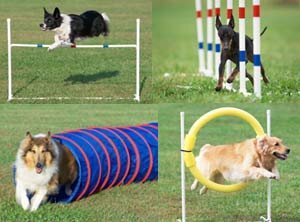 Like teaching little children, the easiest approach to agility training for younger puppies is to turn the exercises into a series of games. The majority of puppies are capable of passing through tunnels and chutes so take advantage of this chance and introduce the tunnels, obstacles and the training area itself as huge play ground. This approach will create positive impressions on him which will also prepare him for future training. If you don’t have a sufficient area for setting up obstacle courses, it is best to use certain games that also encourage agility. Simple equipment like improvised tunnels or walls could be made to augment training. Dogs don’t experience passion when it comes to activities but they have the innate desire to please their owners. This means that they don’t get devoted unless they are rewarded for good actions they have made and that you show your favor for their actions. Their attention span is also very limited so they could not continue training for extended hours. 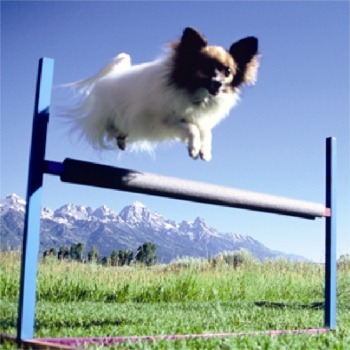 If you want to start training your dog for agility, establish the rule that you should keep each training session and each lesson as short as possible. You don’t have to finish everything in one sitting. You should divide each exercise into sections that the dog could easily understand. Also never end with a negative note. Always ensure that the dog finishes each exercise with praise. Training your dog for agility does not lie on how old or young he is, it lies in the foundation of responsiveness, independence, drive to work alone and to follow the command, and your desire to work with him with enough patience and knowledge of his capacities.